Designed with working teachers in mind. Earn your degree on campus and online. LVC's master's degree in music education is designed to inspire lifelong educators and meet the professional development needs of busy teachers. Immediately implement exciting new pedagogies in your music classroom and harness the power of new technology for music students at every level. We encourage our master's students to take courses at their own pace. Earn your master's degree in music education online, on campus, or blend the two learning experiences to work around your teaching schedule. We emphasize summer coursework to give you even more time to devote to the degree. Personal class sizes and innovative coursework make our music education programs personal, flexible, and relevant to the work you do in your classroom. With the help of an academic advisor, you'll gain professional development opportunities as a veteran educator or guidance on your master's thesis or capstone project if you’re working toward your master’s degree. No matter your professional experience, our master's degree in music education works for you and the needs of your students. Apply to our master's degree in music education for graduate students and working professionals. Through your degree requirements, you'll master everything from research methods to advanced conducting. Pursue a related area of study like Modern Band pedagogy or earn Act 48 Continuing Education Credits. Teach Your Students "Music as a Second Language"
The LVC Music Department is a highly respected leader in "music as a second language," the pedagogy that defines popular music study and our modern band certificate. Take advantage of our long history of modern band instruction throughout your master's degree in music education. Want to design a meaningful STEAM experience for your K–12 students? Our master's in music education coursework addresses how to incorporate technology into the music classroom and gives you tools you can use with your students. Learn how iPads help students with exceptionalities or how Makey Makey kits bridge the worlds of music and software coding. Master lesson plans that involve audio recording and video production. Most importantly, develop pedagogical approaches for incorporating technology into your music classroom to give your students more meaningful learning experiences. 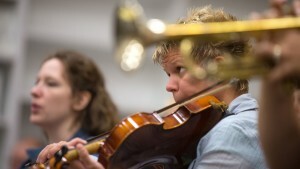 What Makes the Master's Degree in Music Education at LVC Special? Learn how to teach from our award-winning faculty, who specialize in areas like modern band pedagogy, orchestration, and STEAM education. Go beyond directing to gain a broader understanding of K-12 music pedagogy. Enroll to take courses online or in person, so you can earn credits toward your degree and still work full-time. Take advantage of personal class sizes and personal advising that caters to your needs as an educator. Our graduate students are local educators from Dauphin, Lebanon, Lancaster, and York counties, and further afield. All students enrolled in the master's degree in music education program develop the pedagogical skills necessary for teaching 21-st century children in diverse K-12 settings. We also regularly work with veteran educators seeking ACT 48 Continuing Education Credits in Pennsylvania. No matter what stage they're at in their teaching careers, our graduate students learn how to implement new approaches for teaching diverse student groups, global perspectives in music education, and contemporary approaches to music teaching and learning.